Brand: KNT Creations India Pvt Ltd.
Marbonex Translucent Stones are man-made material with the appearance of real natural stone but offers far greater design flexibility. Curved, drilled or moulded into complex translucent panel designs and shapes - it’s a surprisingly affordable way to transform any space. We are engaged in offering Artificial Marble Stone to our clients. Artificial Marble Stone portray the wavy lines in rainbow shades. These Artificial Marble Stone can be used for cladding, designing of floors and on walkways. These Artificial Marble Stone are available as per the clients specifications. These Artificial Marble Stone are available at market leading rates. We are engaged in manufacturing, exporting, supplying and trading a wide variety of products like artificial stone. Artificial stone bangles offered by us are available in varied designs and patterns to suit the client’s requirements. 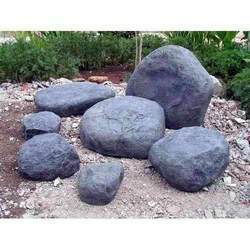 Artificial stones are for exterior purposes. Features: Dirt resistance, boiling water resistance, Heating resistance, Acid resistance. Being a highly effective and fast-moving firm, we are instrumental in providing Artificial Plastic Stone. We are the conspicuous trader of qualitative Artificial Marble Stone that we provide at most genuine rates.